Under the guidance of Dr. Ernest Pereira, the more than 160 students of the Charlotte Symphony's Junior Youth and Youth Orchestras received 25 hours of top-notch coaching with CSO musicians this spring. Training in a professional setting with the pros not only enhanced their development as young musicians, but also prepared them for a series of performances starting with February's 26thannual Youth Festival and culminating with their Spring Concerts. Twenty-one seniors graduated from the Youth Orchestra this May, marking their final performance as Charlotte Symphony Youth Orchestra musicians. Senior Patrick Hoffman plays viola for the CSYO and values the unique experience the Youth Orchestra provides: "[The CSYO is] an opportunity to play mature repertoire where people want to play because it's not something that's required." Hoffman also appreciates the connections he's made saying "Maybe you sit next to someone you've never met from Cornelius. ... [The CSYO] really brings the Charlotte area together." Patrick will attend UNC Greensboro in the fall where he will pursue a degree in Music Education. For their next performance, the Youth Orchestra will play to a crowd of more than two-thousand on Sunday, June 16, presenting the prelude to the Charlotte Symphony's "A Summer Pops Fantasia" concert at Symphony Park. Other summer activities include the Charlotte Symphony Youth Orchestra Summer Camp July 31 August 4, and a once-in-a-lifetime trip to DC in June, where the young musicians will train and perform with prestigious youth orchestras from other cities. Posted in Education & Community, Youth Orchestras. Tagged as CSYO, Education. 1. Order high tech phone lines, called ISDN lines. The letters stand for Integrated Service Digital Network and it's the precursor to high speed Internet. 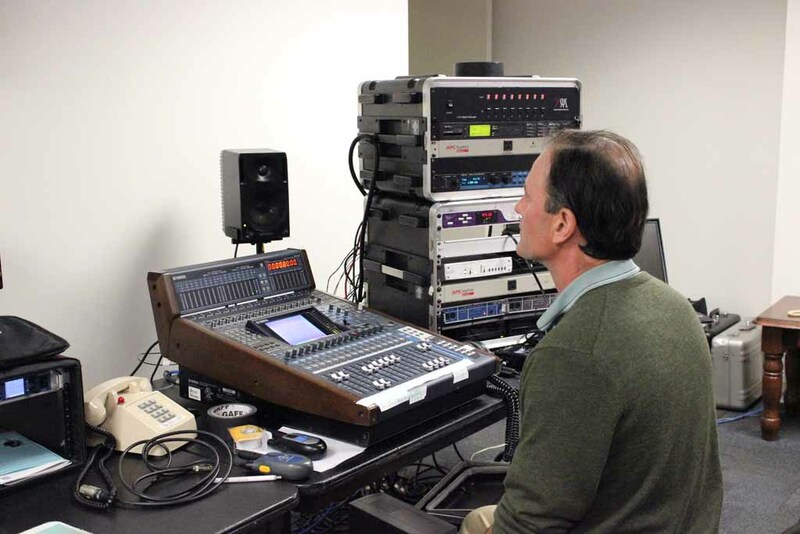 They use these lines to get the stereo signal of the concert performance back to the WDAV studios for broadcast to radios and Internet and smart phone streams. 2. 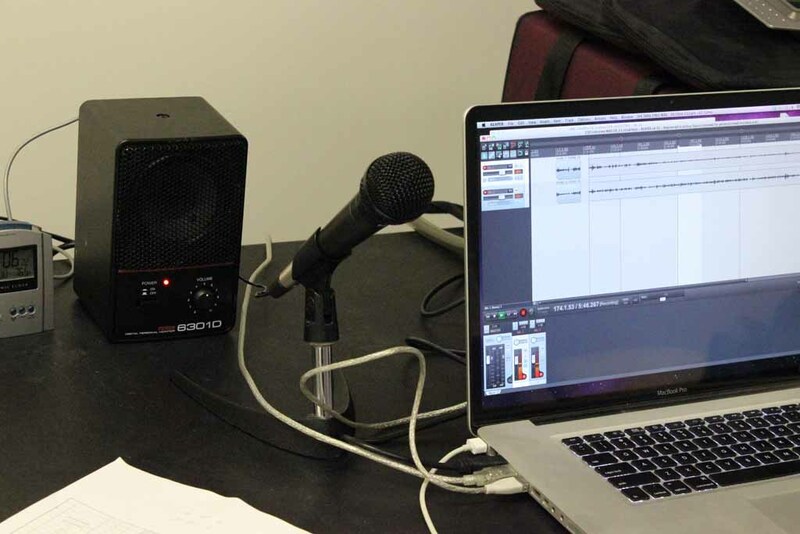 Secure Extra engineering Help Audio engineers set up microphones and sound boards, mix the music and monitor the sound. 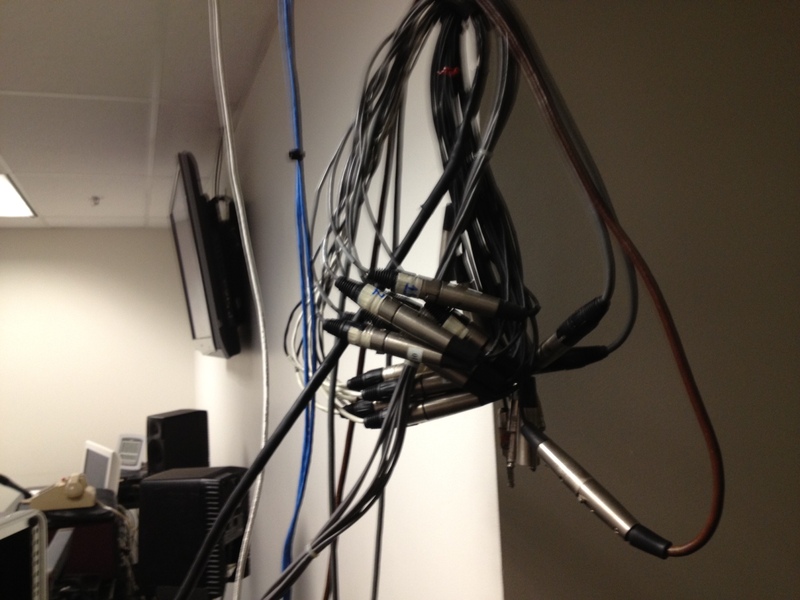 Broadcast engineers establish a connection and monitor the signal back to the studios. 3. 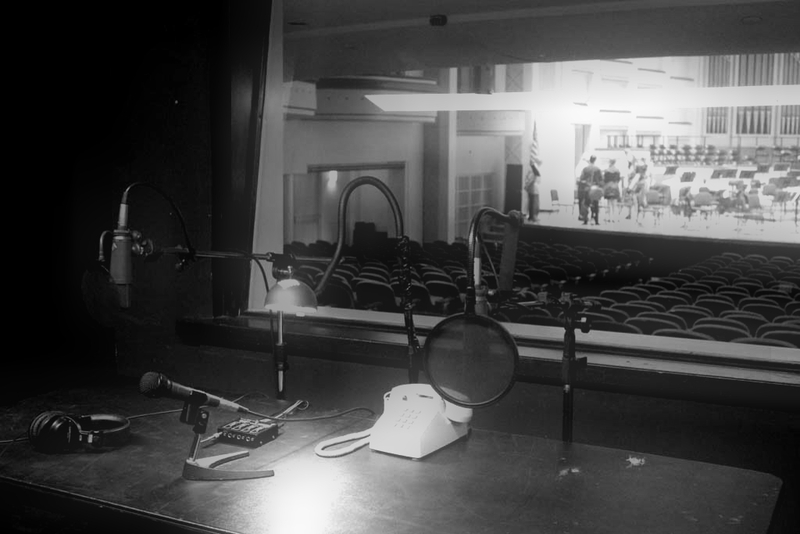 A staff person directs the activities of the hosts and serves as liaison to the broadcast studios. 4. An executive producer plans the outline of the broadcast, acquires and produces interviews and writes a script for the hosts to follow. 1. Spread the word about the broadcast and archive it, before and during, via social media and other digital platforms. 2. Help with logistics, such as having dinner delivered. 3. Coordinate activities with the Symphony and Performing Arts Center staff so that details such as when the concert actually starts and whether there will be any intermissions or encores, are all anticipated and planned for. Thanks to WDAV's Frank Dominguez for these notes. In his words "it's a huge team effort, but one we feel is well worth it because of the ability it gives us to share a live concert performance with listeners who may not have the opportunity to attend." 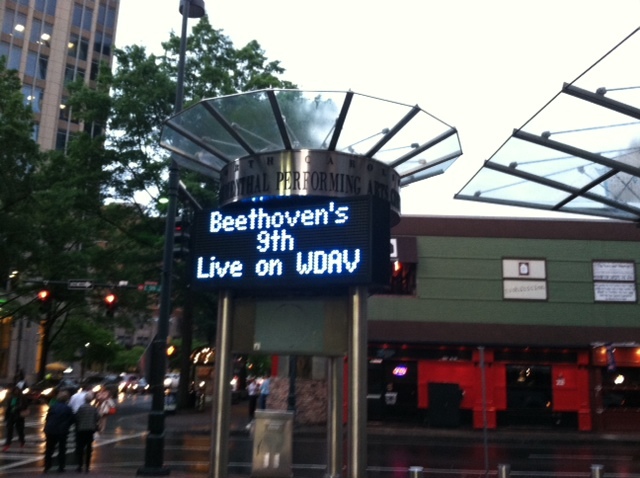 "Tune in at 8pm tonight for a live broadcast of the CSO performing Beethoven's 9th. WDAV thanks OrthoCarolina for sponsoring the broadcast." Posted in Classics. Tagged as Beethoven, Christopher Warren-Green, Classical. The first performance of the Ninth Symphony took place at the Kärnthnerthor Theater in Vienna on May 7, 1824, with Ignaz Umlauf conducting. The first performance of this work by the Charlotte Symphony took place on October 4, 1955 with James Christian Pfohl conducting at Ovens Auditorium. The twelfth and most recent performance set took place April 22-24, 2010 with Stefan Sanderling conducting in the Belk Theater of the Blumenthal Performing Arts Center. Beethoven's final Symphony, the Ninth ("Choral"), represents--on a number of levels--a fitting culmination and apotheosis of the immortal composer's artistic life. The Ninth is by far the most epic of Beethoven's Symphonies, both in terms of length and performing forces. The revolutionary introduction of vocal soloists and chorus in the finale was a bold masterstroke that forever expanded the potential of symphonic expression. extended genesis. A version of the melody first appears in a song Beethoven composed in the mid-1790s, entitled "Gegenliebe" ("Mutual Love"), based upon a text by Gottfried August Bürger. An even more striking premonition of the Ninth Symphony may be found in Beethoven's 1808Fantasia in C minor for Piano, Chorus, and Orchestra, Opus 80. In that work, the melody--in this case, a setting of a text by Christian Kuffner--receives a treatment quite similar in many ways to that found in the "Choral" Symphony. The premiere of Beethoven's Ninth Symphony took place at the Vienna Kärnthnerthor Theater on May 7, 1824. By this stage of Beethoven's life, the composer's hearing had deteriorated to such an extent that conducting the performance was out of the question. Instead, Ignaz Umlauf led the premiere. All the while, however, Beethoven was at Umlauf's side, attempting to direct the tempos for the various movements. The master, though placed in the midst of this confluence of music, heard nothing of it at all and was not even sensible of the applause of the audience at the end of his great work, but continued standing with his back to the audience, and beating the time, till Fräulein Unger, who had sung the contralto part, turned him, or induced him to turn round and face the people, who were still clapping their hands, and giving way to the greatest demonstrations of pleasure. His turning round, and the sudden conviction thereby forced upon everybody that he had not done so before, because he could not hear what was going on, acted like an electric shock on all present, and a volcanic explosion of sympathy and admiration followed, which was repeated again and again, and seemed as if it would never end. Program notes by Ken Meltzer. Posted in Classics. Tagged as Beethoven, Christopher Warren-Green, Classical, History.